Free Verax SNMP Agent Simulator 1.1.0 Free Download - Build virtual, simulated devices without purchasing any hardware! Build virtual, simulated devices without purchasing any hardware! Last Updated: 7/12/2012 | File Size: 1949 KB | License: Freeware | Downloads: 1490 | Developer: Verax Systems Corp.
Verax SNMP agent simulator is a tool that can simulate multiple SNMPv1/v2c agents on a single host on standard 161 port through multi-netting. It allows IT personnel to build virtual, simulated networks of devices without purchasing any additional hardware, for instance for testing purposes. Individual simulated agent responses can be initially retrieved from existing devices and modified at runtime by user defined rules. Statement: First, please download the orginal installation package by clicking the download link. Of course you may also download it from the publisher's website. Using Free Verax SNMP Agent Simulator crack, key, patch, serial number, registration code, keygen is illegal. The download file hosted at publisher website. We do not provide any download link points to Rapidshare, Hotfile, Depositfiles, Mediafire, Filefactory, etc. or obtained from file sharing programs such as Limewire, Kazaa, Imesh, Ares, BearShare, BitTorrent, WinMX etc. Software piracy is theft. 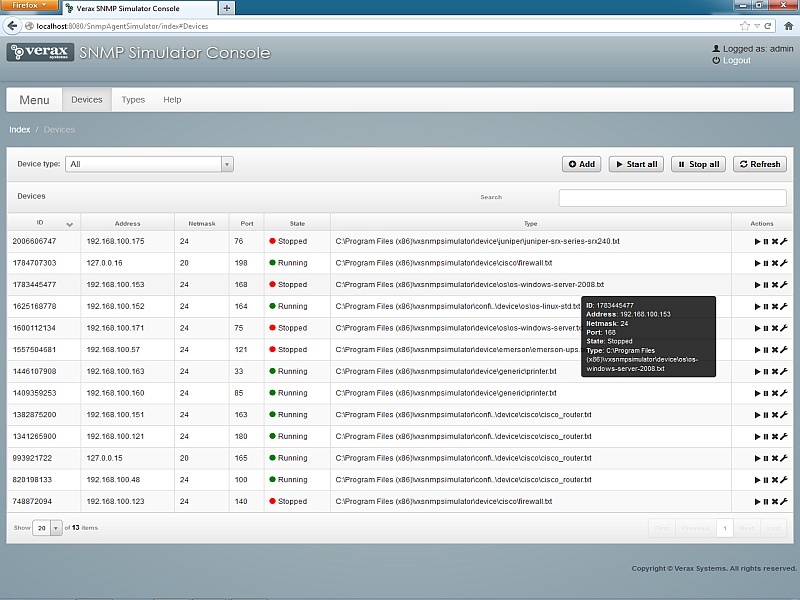 If you like Free Verax SNMP Agent Simulator please buy it.